Hello Hampton Arts fan, this is Adora Concepcion to share with you a layout I created using some Ki Memories goodies. Can you believe January ends today already, the weather is slowly turning around, hopefully getting better for some of us. Rain is a big part of Seattle and so the more rain for us just means spring is on it’s way! Have you started thinking of vacations yet? I have the thought of warn and dry weather sounds so good. With that in mind I made this layout of my sister that I took from our last summer vacation. Note: I used Washi tape to frame and highlight the focal point of my layout. Layered several papers for color and dimension. Embellished the page with cut out prints on the patterned paper , die cut stickers and direct stamping . Hi, It’s Gini here today to share with you one of the cards that I created for the new product release at CHA. The design team was assigned different stamps for the show, and we each were chomping at the bit to see what goodies would arrive in our mailbox. Well, you know I was thrilled to receive a big box of goodies from Hampton Art/ 7gypsies! 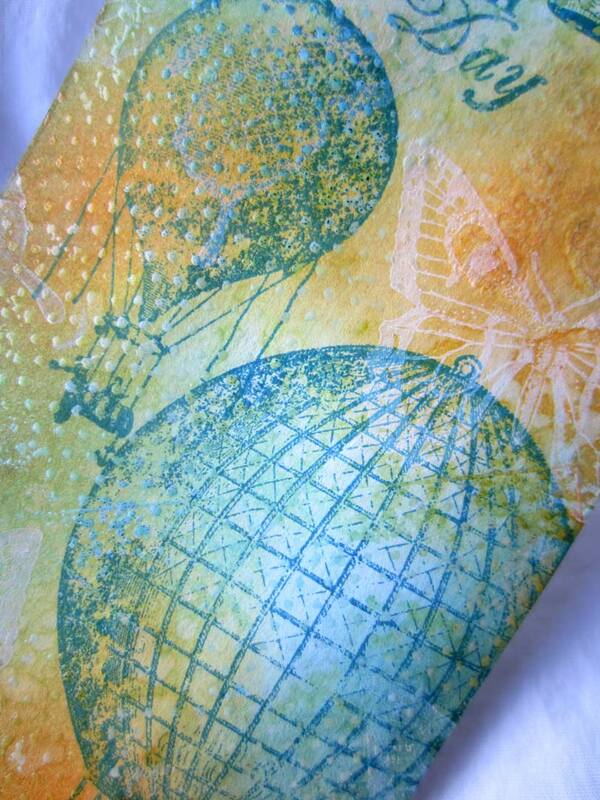 We had a quick turnaround time, so papers, stamps and inks were flying around my studio. But there is something really cool about the rush of getting ready for the big show. I hope you enjoy! 1. Stamp the frames using watermark ink and emboss in silver. Cut the frames out. 2. 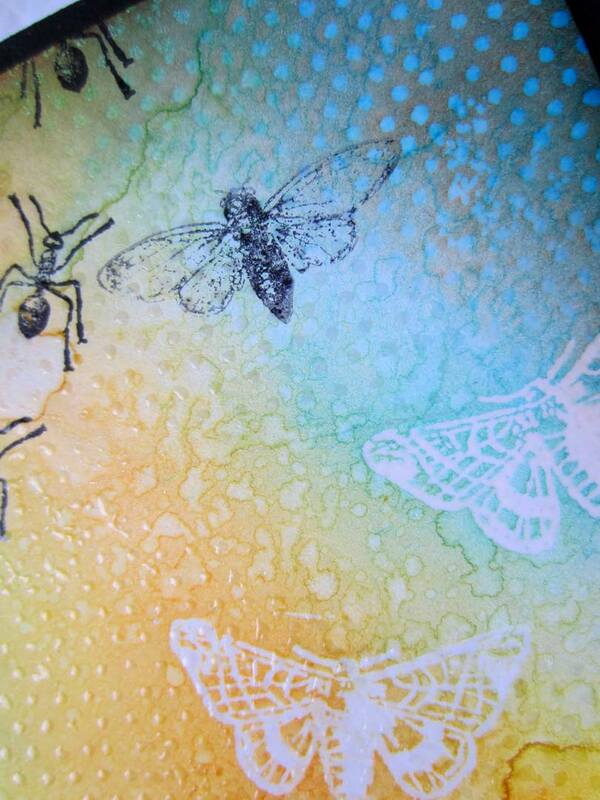 Stamp the sea creatures with the watermark ink and emboss with dark brown powder. Fussy Cut the images and mount on the frames using dimensional adhesive. 3. Add a mat of dark brown behind each of the frames. 4. Ink the edges of patterned papers with Chestnut Roan. Arrange as shown. 5. Add pearls to finish. Hey everyone… Shannon Tidwell is here to share an awesome layout! I first trimmed down my photos so that I could create a border across the page. I think it is fun to couple the Timeline paper along with the fringe border sticker. The stripes offset each other in a neat way. I cut a large flag out of patterned paper to base the title on. I love using the frames to house them. This post is FILLED with the new Hampton Art licensed Graphic 45 French Country Collection stamps! her talent and love for the two companies! Head over to her blog for more inspiration and information! I created an accordion mini album with pockets for tags and photo mats for a few photos. Here is a closer look at each of the album pages. I stamped several layers of stamps, then inked over the top to give a vintage look to the cover. I created a pocket to hold various tags. The French Country stamps are perfect for adding some sentiments and images to the tags. Don’t you LOVE the wood grain details? 2. Stamp branch, leaves, birds and birdhouse. 5. Adhere cloud panel with pop up dots, stamp sentiment below. Don’t you love the perfect sentiments and stamps in the new release from 7gypsies!? From the silverware to the bingo card and everything in between! With over 50 new stamps… the possibilities for AMAZING creations are endless! Gini Williams Cagle has a cute card today that would be perfect for a dinner party invite or a thank you note! 1. Stamp the sentiment on cream cardstock. Cut with a circle die to resemble a dinner plate. Ink the edges with the same red ink. 2. Stamp the silverware using embossing ink and heat emboss with silver powder. Fussy cut the images. 3. Take a small piece of burlap ribbon and fray the edges to look like a dinner napkin. Glue to the card base, then glue the fork on top. Add the knife and spoon to the right side. Use foam adhesives to raise the plate up a little. 4. Add a decorative punched border along the bottom edge of the “tablecloth”. Authentique! That's right, I said "Authentique!" and wonderful paper manufacturers - yeah! Our designers at Hampton Art will share all the goodies with you through the course of this month. Here's a shot of the project I featured in my video tutorial. Hope it lures you to the tube. In the video, I provide a couple more fun interpretations of my new technique I shall name, "Fingermisting!" If it gets your crafty gears churning, try it yourself. I know y'all have mists to use up! ***Supply list available in description box under the video. While the card above is modern and bursting with color, for CHA (that's the Craft and Hobby Association show if you didn't know already), I did some more traditional/vintage style projects with the same stamps. A testament to the versatility of these amazing stamps and the wide range of crafters who will be able to love and use them! Thanks for visiting with me here today, and I'll see you back here next month with some more crafty fodder! Well, here’s your first look at the new Hampton Art licensed Echo Park stamps!!! DT member Nina Yang did a great job with this nifty CAS birthday card. Stamp on colored cardstock with darker shaded ink colors for a cool tone on tone look! Blue/Green/Yellow/Kraft is a good color combo for boys. Design team member Adora Concepcion here! Welcome to our new blog! The thing with card making is it’s really hard to stop with one. I’m sure some of you can relate! As you can see, I mostly used the same supplies on these cards except for the stamps. I guess I can’t stand to see the unused half of the paper/supplies that I started with so I end up with at least 2 cards at a time. Good thing is no one can not have too many cards, right!? Other Supplies: May Arts Ribbon, Patterned Paper, Maya Road Pin. Don’t you love the classic sentiments and images of the new 7gypsies licensed stamp collection?! Designer Gini Williams Cagle was one of the first to get her hands of this great set and look at the masterpiece she made! 1. Stamp the watch on a lightly patterned paper using the watermark ink. Emboss with gold embossing powder, then fussy cut. Stamp the hands of the watch using black ink. 2. Arrange the layers of the card as shown. Use Scor-tape to adhere the ribbon in a straight line. Glue the watch over the layers. 3. Emboss the sentiment in the upper right corner of the card, using the gold powder. Vivian here with a few projects to share at Hampton Art today. First, a colorful card which displayed at the Craft and Hobby Association show in Anaheim this last weekend. It uses a bunch of brand new Hampton Art/7 Gypsies stamps that were revealed at the show. and the signature 7 Gypsies style, which makes our grungy and vintage projects shine so so effortlessly. I can't wait until they become available to you! As I whipped this card up in the rush to get projects ready for CHA (Craft and Hobby Association) show, I didn't have a chance to photograph progress shots. But I did want to share with you the easy techniques that went into this colorful project, so I made a whole new project/video tutorial with some of my absolute favorite Hampton Art stamps that are readily available! Sneak peak to lure you over to youtube! The video is ready and available for your viewing pleasure here! Hope you'll take a break from your day to check it out - you just may be inspired to get funky wit' yo' colors! ***Supply list for the project above can be found in the description box under the video. Hi! Gretchen McElveen here with another layout using KI's awesome Flashback line! I love the colors in this line! I have found that I can really make them work with any pictures I have. I cut up the blocks from the "Blocks of Time" patterned paper and used them separately as part of the background for this layout. Also I used a 1" circle punch to create the scalloped border on this page (I have been loving that technique lately!). Thanks for looking and thanks for stopping by the blog today! We just want to take a second to thank you all for being AWESOME fans and supporters of Hampton Art!!! We had a great time at CHA 2013 and we owe it all to you! Thank you for your dedication to papercrafting and your excitement for all of our new licensed stamp collections! What a great show!!! Wow, today is the last official day of CHA Winter 2013 and we’ve had an amazing time showcasing our new products! It’s always a happy day when it’s filled with art and crafts! DT member Linda Abadie made this cheerful card we truly adore and we choose to celebrate today as the close of a great trade show and the beginning of a great year! 2. 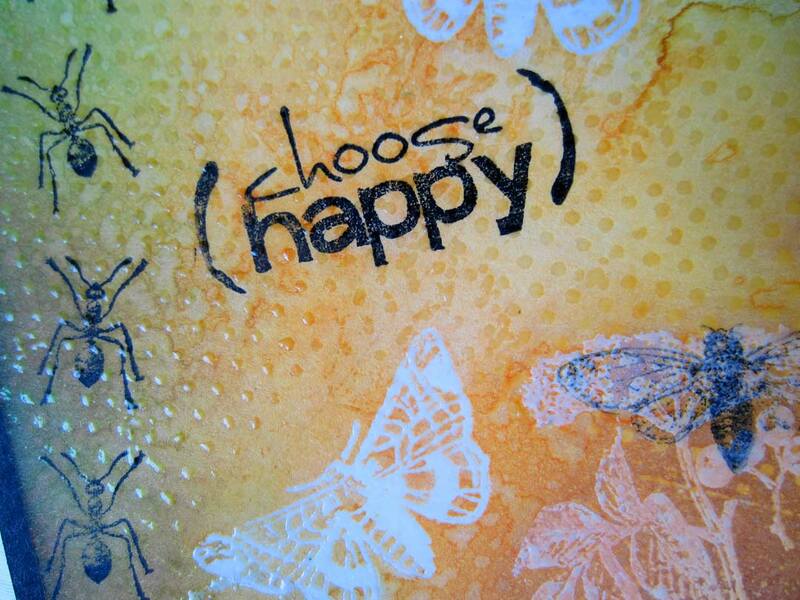 Add title “Oh Happy Day!” on the bottom of the project using foam tape, distress around the edges. Earlier in the week, Beverly shared her Lavender Thank You card and now DT member Dana Warren has a beautiful purple happy birthday card! With our periwinkle design scheme… you know we’re loving it! OH yes, HAPPY FIRST DAY OF CHA!!! We’ll be sure to post some pictures over the weekend in case you’re not in Anaheim. 1. Trim cardstock to fit cardbase. Trim pattern transparency to fit cardbase. Adhere transparency to purple cardstock and adhere this to cardbase. 4. Stamp happy birthday in black on white paper strip. Design team member Nina Yang made a great masculine thank you card using cool ink colors and distressed patterns. What man wouldn’t love this clean and simple handmade note? !